Th1/Tc1 inflammation and remodeling responses characterized by tissue atrophy and destruction frequently coexist in human diseases and disorders. However, the mechanisms that are used by Th1/Tc1 cytokines, like IFN-γ, to induce these responses have not been defined. To elucidate the mechanism(s) of IFN-γ-induced tissue remodeling and destruction, we characterized the pathway that lung-targeted, transgenic IFN-γ uses to induce alveolar remodeling in a murine pulmonary emphysema modeling system. In these mice, transgenic IFN-γ caused epithelial cell DNA injury and apoptosis detectable with TUNEL (Roche) and dual annexin V and propidium iodide staining. These responses were associated with death receptor and mitochondrial apoptosis pathway activation. Importantly, apoptosis inhibition with a caspase inhibitor (N-benzylcarboxy-Val-Ala-Asp-fluoromethyl-ketone) or a null mutation of caspase-3 blocked this DNA injury and apoptosis response and significantly ameliorated IFN-γ-induced emphysema. These interventions also ameliorated IFN-γ-induced inflammation and decreased pulmonary protease burden. 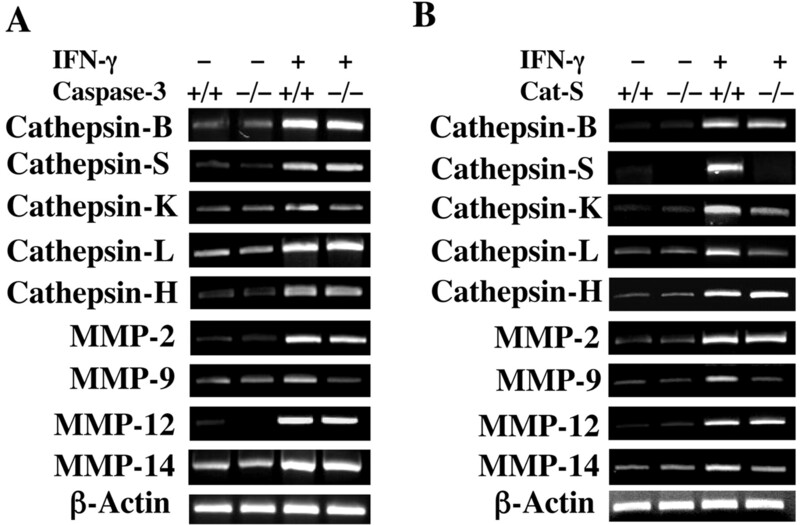 Selective cathepsin S inhibition and a null mutation of cathepsin S also decreased IFN-γ-induced DNA injury, apoptosis, emphysema, inflammation, and protease accumulation. These studies demonstrate that cathepsin S-dependent epithelial cell apoptosis is a critical event in the pathogenesis of IFN-γ-induced alveolar remodeling and emphysema. They also link inflammation, protease/antiprotease alterations, and protease-dependent apoptosis in the pathogenesis of Th1/Tc1 cytokine-induced tissue remodeling and destructive responses. The type II IFN, IFN-γ, was originally defined based on its antiviral capacities. It is now appreciated to be the prototypic Th1/Tc1 cytokine and is known to play a key role in the regulation of diverse immune responses, including pathogen recognition, Ag processing and presentation, cellular proliferation, microbicidal effector activation, and leukocyte trafficking (1). In keeping with its important biologic functions, dysregulated IFN-γ production has been implicated in a large number of diseases including atherosclerosis (2), Crohn’s disease (3), Schistosoma infection (4), celiac disease (5), rheumatoid arthritis (6), periodontitis (7), Behçet’s disease (8), apthous ulcers (9), autoimmune gastritis (10), and uveoritinitis (11). An interesting feature of many of these responses is the close approximation of Th1/Tc1 inflammation and remodeling characterized by tissue atrophy and/or destruction. This can be appreciated in the joint erosions in rheumatoid arthritis, ulcerations in Behçet’s and apthous lesions, gingival atrophy in periodontal disease, gastric atrophy in autoimmune gastritis, ocular destruction in uveoritinitis, and histologic necrosis in mycobacterial granulomas (6, 7, 8, 9, 10, 11, 12). This is also seen in pulmonary emphysema where alveolar septal rupture and enhanced type I cytokine production, increased numbers of CD3+ and CD8+ cells that produce IFN-γ, and increased levels of the IFN-γ target gene IFN-γ-inducible protein 10/CXCL10 are juxtaposed (13, 14, 15, 16, 17, 18). Studies from our laboratory have also demonstrated that the transgenic overexpression of IFN-γ in the adult murine lung causes pulmonary emphysema (19). In accord with these observations, microarray evaluations recently demonstrated that Th2 responses preferentially stimulate genes involved in wound healing and fibrosis while Th1 responses preferentially stimulate genes that are involved in apoptosis and tissue injury (4). Surprisingly, although there is an impressive amount of knowledge regarding the mechanisms of IFN-γ-induced immunomodulation (reviewed in Ref.1), the mechanisms of IFN-γ-induced tissue injury, remodeling, and destruction have not been adequately defined. Chronic obstructive pulmonary disease (COPD)3 is a generic term that includes emphysema and chronic bronchitis (20, 21) and is a profound unmet medical need in the United States and the world. For >40 years, the protease/antiprotease hypothesis dominated thinking in this area. This theory proposes that the normal lung is protected by an antiprotease “shield” that negates the effects of proteases in the airway or parenchyma (20, 21). It also proposes that emphysema is generated as a result of an increase in proteases and/or a decrease in antiproteases with this proteolytic excess causing alveolar septal rupture by digesting septal matrix proteins (20, 21). In keeping with recent studies highlighting the Th1/Tc1 inflammation in lungs from patients with COPD (13, 14, 16, 18, 22, 23) and our studies demonstrating that IFN-γ causes protease-antiprotease abnormalities and emphysema in the murine lung (19), it has been assumed that the Th1/Tc1 inflammatory response is the cause of the protease-anitprotease abnormalities in pulmonary emphysema. However, recent studies have added complexity to this concept of disease pathogenesis by demonstrating that that there are also increased levels of structural cell apoptosis in lungs from patients with emphysema and animal models of this disorder (24, 25, 26, 27, 28). Surprisingly, the relationships between the inflammatory, protease-antiprotease and apoptosis alterations in COPD tissues are poorly understood. In addition, the mechanism(s) by which Th1/Tc1 cytokines, like IFN-γ, induce tissue destruction and the roles of apoptosis in these responses have not been defined. Lastly, the possibility that proteases, while digesting matrix proteins, also contribute to the pathogenesis of emphysema by inducing alveolar cellular injury and or apoptosis has not been investigated. We hypothesized that an intimate relationship exists among the inflammatory, proteolytic, and apoptotic events in IFN-γ-mediated tissue remodeling responses. To test this hypothesis, we defined the relationships among IFN-γ, protease-antiprotease alterations, DNA injury and apoptosis, tissue destruction, and inflammation in transgenic mice in which lung-targeted IFN-γ causes pulmonary emphysema. 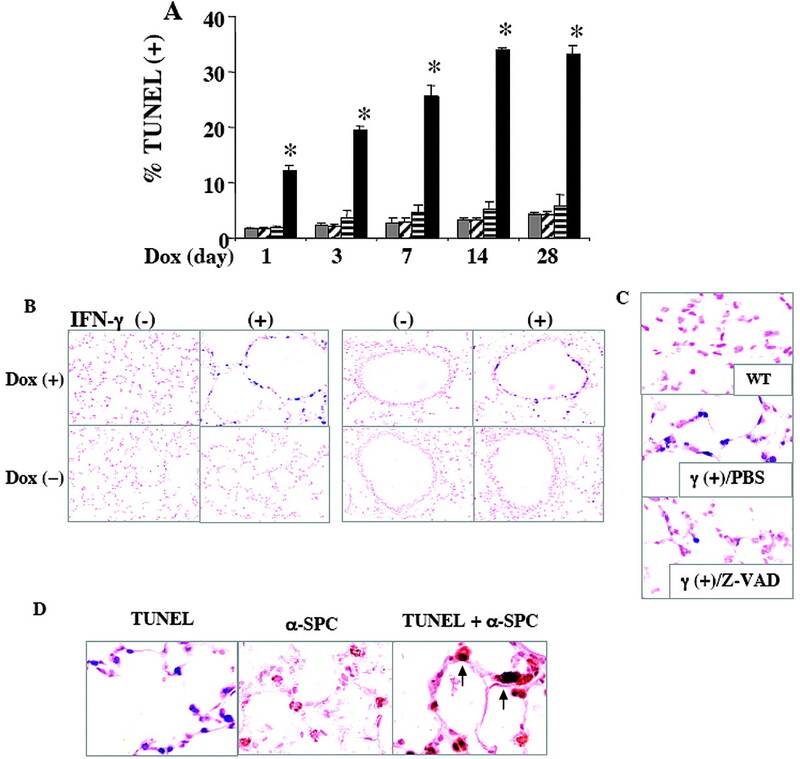 These studies demonstrate that IFN-γ induces alveolar epithelial cell DNA injury and apoptosis via a novel cathepsin S-dependent pathway and that this apoptosis is a critical event in the pathogenesis of alveolar remodeling, emphysema, and inflammation. CC10-rtTA-IFN-γ mice that had been generated in our laboratory were used in these studies (19). These are dual transgene-positive animals in which the reverse tetracycline transactivator (rtTA) drives the expression of the murine IFN-γ gene in a lung-specific and externally regulatable fashion. The transgene in these mice is activated by adding doxycycline (dox) to the animal’s drinking water. Construct 1 in these mice contains the Clara cell 10-kDa protein (CC10) promoter, rtTA, and human growth hormone intronic and polyadenylation sequences. The rtTA is a fusion protein made up of a mutated tetracycline repressor (rtet-R) and the herpesvirus VP-16 transactivator. The second construct contains a polymeric tetracycline operator, minimal CMV promoter, murine IFN-γ cDNA, and human growth hormone intronic and adenylation signals. In this system, the CC10 promoter directs the expression of rtTA to the lung. In the presence of dox, rtTA is able to bind in trans to the tetracycline operator and the VP-16 transactivator activates IFN-γ gene transcription. In the absence of dox, rtTA binding does not occur or occurs at very low levels, and no or very low-level gene transcription is noted. These mice were maintained as dual transgene (+) heterozygotes (referred to as transgene; Tg (+) hereafter). The details of both genetic constructs, the methods of microinjection and genotype evaluation, the inducibility, and the emphysematous and inflammatory phenotype of CC10-rtTA-IFN-γ mice have been previously described (19). Cathepsin S (Cat S) null mutant (−/−) and caspase-3−/− mice were generated as described by Shi et al. (29) and Kuida K et al. (30), respectively, and bred onto the C57BL/6 background. On this background, caspase-3−/− mice are deaf but are otherwise phenotypically normal (31). CC10-rtTA-IFN-γ mice with wild-type+/+ or null−/− Cat S or caspase-3 loci were generated by breeding C57BL/6 IFN-γ-overexpressing mice with the Cat S−/− or caspase-3−/− animals. PCR was used to define the transgenic status of all offspring using primers that detected rtTA and/or the junction region of the murine IFN-γ-human growth hormone construct. The Cat S loci were evaluated by PCR using primers 5′ (5′-CTT GAA GGG CAG CTG AAG CTG-3′) and 3′ (5′-GTA GGA AGC GTC TGC CTC TAT-3′). The caspase-3 loci were evaluated using the following primers: 5′ (5′-TGC-TAA AGC GCA TGC TCC AGA CTG-3′) and 3′ (5′-GCG AGT GAG AAT GTG CAT AAA TTC-3′). The evaluation of QACRG/NEO was undertaken with the following primers 5′ (5′-GGG AAA CCA ACA GTA GTC AGT CCT-3′) and 3′ (5′-GCG AGT GAG AAT GTG CAT AAA TTC-3′). CC10-rtTA-IFN-γ mice and littermate controls were maintained on normal water until they were 4–6 wk old. They were then randomized to normal water or water with dox as previously described (19). Four- to 6-wk-old transgene-negative and transgene-positive mice were randomized to receive the desired agent or the appropriate vehicle control. Two days later, they were randomized to normal or dox water and maintained on this regimen for 2–4 wk. At the end of this interval, the animals were sacrificed and pulmonary phenotype was assessed as described below. In experiments in which caspase-mediated apoptosis was being evaluated, N-benzylcarboxy-Val-Ala-Asp-fluoromethylketone (Z-VAD-fmk) (3 μg/kg/day; Calbiochem) was given via an i.p. route. When cathepsins were being evaluated, the broad-spectrum cysteine protease inhibitors leupeptin (15 mg/kg/day; Sigma-Aldrich) or E-64 (7.5 mg/kg/day; Sigma-Aldrich) were given via an i.p. route. To evaluate Cat S, we used the selective Cat S inhibitor 05141 (10 mg/kg/day twice a day by gavage; Sanofi-Aventis). In all cases, comparisons to appropriate vehicle controls were undertaken. Solutions of Cat S inhibitor in varying concentrations were prepared in 10 μl of DMSO and then diluted into 40 μl of the appropriate assay buffer. The following assay buffers were used: Cat S assay: MES, 50 mM (pH 6.5); EDTA, 2.5 mM; NaCl, 100 mM; cathepsin K or L assay: MES, 50 mM (pH 5.5); EDTA, 2.5 mM; DTT, 2.5 mM; cathepsin B assay: N,N-bis(2-hydroxyethyl)-2-aminoethanesulfonic acid, 50 mM (pH 6.0); polyoxyethylenesorbitan monolaurate, 0.05%; and DTT, 2.5 mM. Human Cat S (0.158 pmol), cathepsin K (0.091 pmol), cathepsin L (0.05 pmol), or cathepsin B (0.025 pmol) in 25 μl of assay buffer were added to the compound dilutions. The assay solutions were incubated for 30 min at ambient temperature. Substrates for Cat S (Z-Val-Val-Arg-AMC, 9 nmol), cathepsin K (Z-Phe-Arg-AMC, 4 nmol), cathepsin L (Z-Phe-Arg-AMC, 1 nmol), or cathepsin B (Z-FR-AMC, 20 nmol) in 25 μl of assay buffer were added to the assay solutions. Hydrolysis was followed spectrophotometrically (l460 nm) for 5 min. Apparent inhibition constants (Ki) were calculated using a standard mathematical model. The characteristics of this inhibitor can be seen in Table I⇓. End-labeling of exposed 3′-OH ends of DNA fragments in paraffin-embedded tissue was undertaken with the TUNEL in situ cell death detection kit AP (Roche Diagnostics) using the instructions provided by the manufacturer as previously described by our laboratory (32). Type II cells were isolated from wild-type (WT) and IFN-γ transgenic mice using the methods developed by Corti et al. (33). Annexin V and propidium iodine (PI) staining were undertaken with the Annexin VFITC apoptosis detection kit (BD Biosciences) as described by the manufacturer. Analysis was undertaken by flow cytometry (BD Biosciences). Mice were euthanized, the trachea was isolated by blunt dissection, tubing was secured in the airway, and BAL with PBS was undertaken as described previously (32). The levels of IFN-γ were determined using a commercial ELISA (R&D Systems) as per the manufacturer’s instructions. Animals were anesthetized, a median sternotomy was performed, and right heart perfusion was accomplished with calcium- and magnesium-free PBS to clear the pulmonary intravascular space. The lungs were then fixed to pressure (25 cm) with neutral-buffered 10% Formalin, fixed overnight in 10% Formalin, embedded in paraffin, sectioned at 5 μm, and stained. H&E stains were performed in the Research Histology Laboratory of the Department of Pathology at Yale University School of Medicine. Lung volume, alveolar size, and lung compliance were assessed via volume displacement and morphometric chord length assessments as previously described (19, 32, 34). mRNA levels were assessed using RT-PCR as previously described by our laboratory (19, 32). In the RT-PCR assays, gene-specific primers were used to amplify selected regions of each target moiety. The primers for the targeted genes are detailed in Table II⇓. In selected experiments, RNase protection was also used. These assays were undertaken with mAPO-1, mAPO-2, and mAPO-3 multiprobe kits (BD Pharmingen) as per the manufacturer’s instructions. In selected experiments, TUNEL evaluations and immunohistochemistry for surfactant aproprotein C (SP-C) were simultaneously undertaken. In these experiments, slides were deparaffinized with xylene and graded ethanol and taken to water. Microwave Ag retrieval was done with DAKO pH 6 Ag retrieval solution, and slides were treated with DAKO protein block and rinsed. TUNEL (Roche) staining was then undertaken as described above and developed with alkaline phosphatase/5-bromo-4-chloro-3-indolyl phosphate/nitroblue tetrazolium (blue). Afterward, tissue was counterstained with goat anti-SP-C (Santa Cruz Biotechnology) overnight and developed with biotylinated anti-goat/streptavidin peroxidase/3-amino-9-ethyl carbazole (red). Whole lung lysates were prepared using lysis buffer as previously described (34). The lysates were then clarified by centrifugation at 10,000 × g for 15 min, and supernatant protein concentrations were determined with a Bio-Rad assay kit (Bio-Rad). The samples were then mixed with an equal volume of 2× SDS-PAGE sample buffer (100 mM Tris-Cl (pH 6.8), 200 mM DTT, 4% SDS, 0.2% bromphenol blue, and 20% glycerol), heated in a boiling water bath, and equal amounts were loaded onto 12% SDS-polyacrylamide gels (Bio-Rad) and transferred to immune-blot polyvinylidene difluoride membrane (Bio-Rad). After transfer the membranes were blocked for 1 h in nonfat dried milk, rinsed, incubated with the appropriate primary Abs for 1.5 h at room temperature or overnight at 4°C, washed, incubated with secondary Ab (diluted 1/1000–1/2000) for 1.5 h at room temperature, and washed in 0.05% Tween 20. Immunoreactive proteins were visualized using the 20× LumiGLO reagent and 20× peroxide according to the manufacturer’s instructions (Cell Signaling Technology). The membranes were exposed to BioMax MR films (Eastman Kodak). Rabbit polyclonal Abs reactive to caspase-3, caspase-9, Cat S, and β-tubulin were purchased from Santa Cruz Biotechnology and polyclonal anti-caspase-8 was obtained from BD Biosciences. The bioactivities of caspases-3 and -8 were measured with colorimetric assays using the CaspACE assay system (Promega) and the Caspase 8 Colorimetric Activity assay kit (Chemicon), respectively. In brief, lung tissues were homogenized and centrifuged, and the supernatants were incubated with the colorimetric substrate Ac-Asp-Glu-Val-Asp-p-nitroanilide (Ac-DEVD-pNA) or N-acetyl-Ile-Glu-Thr-Asp-p-nitroanilide (Ac-IETD-pNA) for caspases 3 and 8, respectively. The release of pNA was measured at 405 nm using a spectrophotometer. Normally distributed data are expressed as mean ± SEM and were assessed for significance by Student’s t test or ANOVA as appropriate. Data that were not normally distributed were assessed for significance using the Wilcoxon rank sum test for groups of two or the Kruskal-Wallis statistic for groups of three. Statistical analysis was performed using Stata (version 7.0) and Deltagraph. Statistical significance was defined at a level of p < 0.05. We previously demonstrated that the transgenic overexpression of IFN-γ causes emphysema in the murine lung (19). To investigate the mechanism(s) of this response, TUNEL staining was used to determine whether transgenic IFN-γ caused DNA injury and/or apoptosis in this setting. In WT mice on normal or dox water and transgenic mice on normal water, ≤2.5% of all nuclei were TUNEL stain positive (Fig. 1⇓A and data not shown). In contrast, IFN-γ induction in transgenic mice caused a remarkable increase in the number of TUNEL+ nuclei (Fig. 1⇓A). These effects were seen after as little as 1 day and peaked after 14–28 days of dox administration (Fig. 1⇓A). At these latter time points, ∼33% of the nuclei in lung tissue sections were TUNEL stain positive (Fig. 1⇓A). The majority of these cells were airway epithelial cells and type I and type II alveolar epithelial cells on light microscopic evaluations (Fig. 1⇓, B and C). In accord with these observations, double staining with TUNEL and anti-SP-C Abs revealed a large number of alveolar type II epithelial cells that were TUNEL positive and SP-C positive (Fig. 1⇓, D). TUNEL-positive and SP-C-negative cells were also appreciated (data not shown). Transgenic IFN-γ-induced DNA injury and apoptosis. CC10-rtTA-IFN-γ transgene (+) mice and their transgene (−) littermate controls were placed on normal or dox water for the noted intervals. Their lungs were then removed and TUNEL staining was evaluated. A illustrates the percentage of total nuclei that were TUNEL (+) in transgene (-) mice on normal water (▦), transgene (−) mice on dox water (▨), transgene (+) mice on normal water (▤), and transgene (+) mice on dox water (▪). Each value represents the mean ± SEM of a minimum of six animals (∗, p < 0.01 vs the other three groups). The TUNEL staining in lungs from transgene (−) and transgene (+) mice treated for 4 wk with normal water (dox (−)) or dox water (dox (+)) at 10× is seen in B. The TUNEL staining in lungs from transgene (−) (WT) mice and transgene (+) mice (γ (+)) treated with Z-VAD-fmk or PBS vehicle control (100×) after 4 wk of dox administration is seen in C. D, Double staining is used to localize TUNEL staining (blue, left), SP-C (red) (middle), and TUNEL (+)/SP-C (+) cells (right). Representative double staining cells are highlighted by the arrows. The experiments in A–C are representative of a minimum of 10 similar evaluations and the results in D are representative of the results obtained in four similar evaluations. To define the cellular response(s) that was ongoing, dual annexin V and PI staining and FACS analysis were undertaken. Using whole lung cells from WT and transgenic mice, these studies demonstrated that many of the cells were undergoing apoptosis (increased annexin V staining only). Smaller numbers of cells manifest increased PI staining only and were undergoing necrosis or late-stage apoptosis with compromised plasma membranes. Small numbers of cells also had increases in annexin V and PI staining. These cells were undergoing apoptosis and necrosis. At the peak of this response, ∼15% of whole lung cells were undergoing cell death (Fig. 2⇓A). A similar increase in the number of cells undergoing apoptosis was seen with dual staining and FACS analysis of purified alveolar type II cells (Fig. 2⇓B) from WT and transgenic mice. 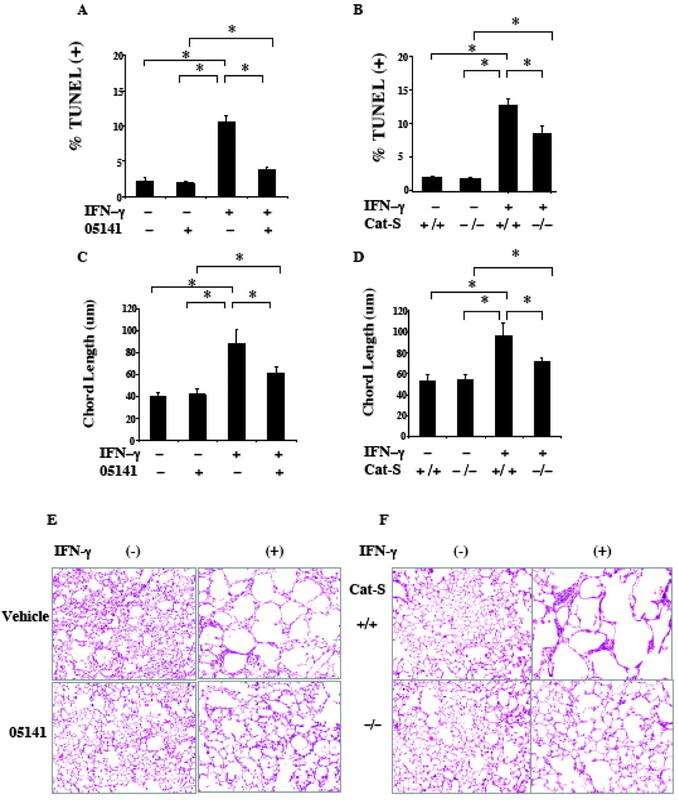 These studies demonstrate that IFN-γ is a potent inducer of epithelial cell DNA injury and apoptosis in the murine lung. Dual annexin V and PI staining. Apoptosis and necrosis were evaluated with annexin V and PI staining of total lung cells (A) and alveolar type II cells (B) isolated from WT and transgene (+) mice on dox water for 4 wk. The experiments in these panels are representative of the results obtained in four similar evaluations. To determine whether apoptosis contributed to the pathogenesis of IFN-γ-induced alveolar remodeling and emphysema, we compared the effects of IFN-γ in mice treated with the caspase inhibitor Z-VAD-fmk or vehicle control. In addition, we bred the CC10-rtTA-IFN-γ transgenic mice with caspase-3−/− animals and compared the effects of IFN-γ in mice with (+/+) and (−/−) caspase-3 loci. As previously reported (19), IFN-γ caused emphysema with alveolar and lung enlargement and increases in pulmonary static compliance (Fig. 3⇓ and data not shown). The chemical (Z-VAD-fmk) and the genetic (caspase-3−/−) interventions decreased the levels of IFN-γ-induced apoptosis by ≥85%. They simultaneously decreased the emphysema-generating effects of IFN-γ. These alterations were readily apparent in measurements of lung volume, alveolar morphometry, alveolar histology, and lung compliance in mice on dox for as little as 2 wk and as long as 4 mo (Fig. 3⇓ and data not shown). In all cases, these alterations, although significant, did not return the parameters to normal. (Fig. 3⇓ and data not shown). Thus, IFN-γ induces pulmonary emphysema via a mechanism that is at least partially apoptosis dependent. 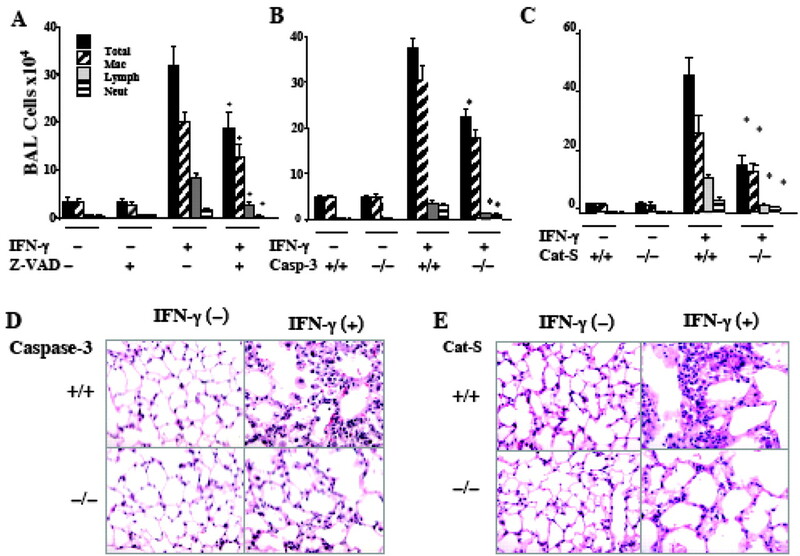 Effects of inhibition of apoptosis on IFN-γ-induced emphysema. A, C, and E, Transgene (−) and transgene (+) mice were randomized to receive Z-VAD-fmk or PBS vehicle control and then placed on dox for 2 wk. B, D, and F, We compare transgene (+) mice with WT (+/+) and null mutant (−/−) caspase-3 loci. Lung volume (A and B), chord length (C and D), and alveolar histology (E and F) were evaluated. The values in A–D are the mean ± SEM of evaluations in a minimum of six animals. E and F, Representative of six similar experiments (∗, p < 0.01). We previously demonstrated that IFN-γ causes prominent alterations in protease-antiprotease balance in the lung (19). To define the role(s) of Cat S in this response, studies were undertaken to define the effects of IFN-γ on this important protease. As seen in Fig. 4⇓, IFN-γ was a potent stimulator of Cat S mRNA and protein. This stimulation was seen in lungs from transgenic mice after as little as 24 h of dox administration and persisted throughout the study interval (Fig. 4⇓A and data not shown). Immunohistochemical evaluations demonstrated that Cat S protein could only be appreciated in rare, random cells in lungs from WT mice on normal water or dox water and transgenic mice on normal water. In contrast, Cat S protein was readily appreciated in macrophages and alveolar epithelial cells in lungs from transgenic mice on dox water (Fig. 4⇓B). This staining was Cat S specific because it was not seen in the absence of primary Ab and was abrogated by excess unlabeled Cat S protein (data not shown). These studies demonstrate that IFN-γ is a potent stimulator of macrophage and epithelial cell Cat S.
Regulation of Cat S by IFN-γ. WT (transgene (−)) and transgene (+) mice were randomized to normal water or dox water. At the noted intervals, the levels of Cat S mRNA were evaluated (A). After 4 wk of dox, Western blot analysis (B) and immunohistochemistry were used to identify and localize Cat S (C, top panels, ×10; bottom panels, ×40). The open and solid arrows in C highlight Cat S staining macrophages and alveolar epithelial cells, respectively. Studies were next undertaken to determine whether Cat S played an important role in the pathogenesis of IFN-γ-induced DNA injury, apoptosis, and emphysema. This was done by comparing the levels of apoptosis and emphysema in transgenic mice treated with the selective Cat S inhibitor 05141 (Table I⇑) or its vehicle control. We also bred the IFN-γ transgenic mice with Cat S−/− mice and compared the effects of IFN-γ in mice with (+/+) and (−/−) Cat S loci. As noted above, IFN-γ was a potent inducer of DNA injury/apoptosis and emphysema in the murine lung. Importantly, treatment with 05141 or a null mutation of Cat S significantly inhibited these injury/apoptosis and emphysematous responses (Fig. 5⇓). Similar decreases in DNA injury/apoptosis and emphysema were seen in mice treated with the broad-spectrum, noncaspase, cysteine protease inhibitors leupeptin and E-64 (data not shown). Thus, IFN-γ induces pulmonary epithelial cell DNA injury and apoptosis via a mechanism that is, at least in part, Cat S dependent. 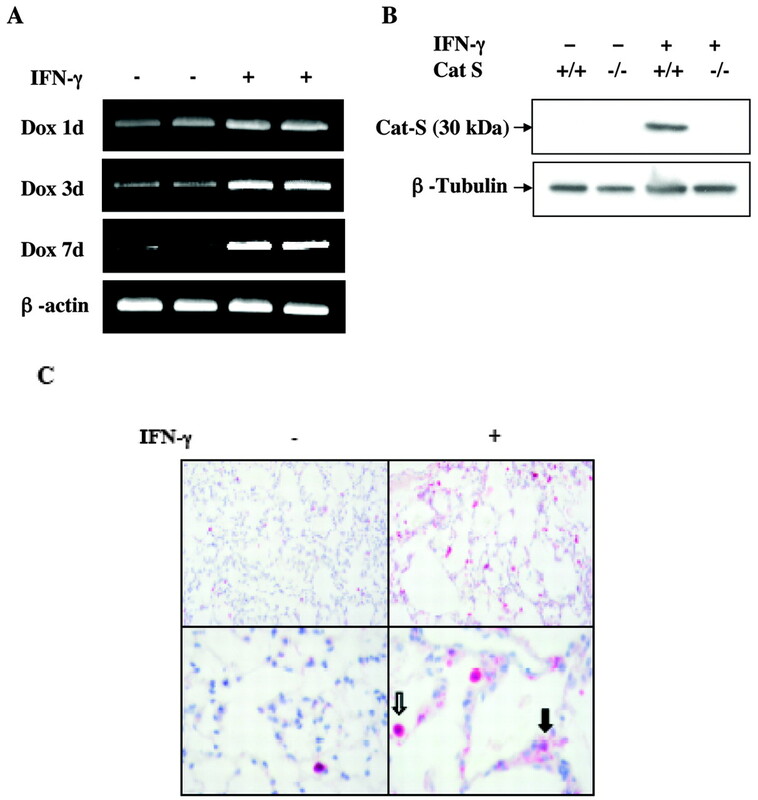 Effects of 05141 or a Cat S null mutation on IFN-γ-induced DNA injury/apoptosis and emphysema. A, C, and E, Transgene (−) and transgene (+) mice were randomized to treatment with 05141 or PBS vehicle control and then placed on dox. B, D, and F, We compare transgene (+) mice with (+/+) and null mutant (−/−) Cat S loci. The percentage of cells that were TUNEL (+) (A and B), the chord length of the alveoli (C and D), and the histologic appearance of the tissues (E and F) were evaluated. The values in A–D are the mean ± SEM of evaluations in a minimum of six animals. E and F, Representative of six similar experiments (∗, p < 0.01). To define the mechanism of IFN-γ-induced apoptosis and the mechanism by which Cat S regulates this response, we compared the expression of key mediators of apoptosis in IFN-γ transgenic mice with (+/+) and (−/−) Cat S loci. IFN-γ-induced apoptosis was associated with significant increases in the levels of mRNA encoding key components of the extrinsic (death receptor) and intrinsic (mitochondrial) apoptosis pathways, including Fas, Fas ligand (FasL), TNF-α. TNF-related apoptosis-inducing ligand (TRAIL), Bak, Bid, Bim, caspase-3, -6, -8, and -9, and protein kinase Cδ (PKCδ) (Fig. 6⇓A and data not shown). Interestingly, the Bcl-2 family apoptosis inhibitor A1 was also stimulated while apoptosis-inducing factor and Bcl-2 were not similarly altered (Fig. 6⇓A). Bioassays and Western blot evaluations also demonstrated that IFN-γ activated caspase-3, -8, and -9 (Fig. 6⇓, B and C). Interestingly, an absence of Cat S diminished the ability of IFN-γ to augment the levels of mRNA encoding Fas, FasL, TRAIL, TNF-α, Bid, Bim, PKCδ, and caspase-3, -8, and -9 (Fig. 6⇓A and data not shown). 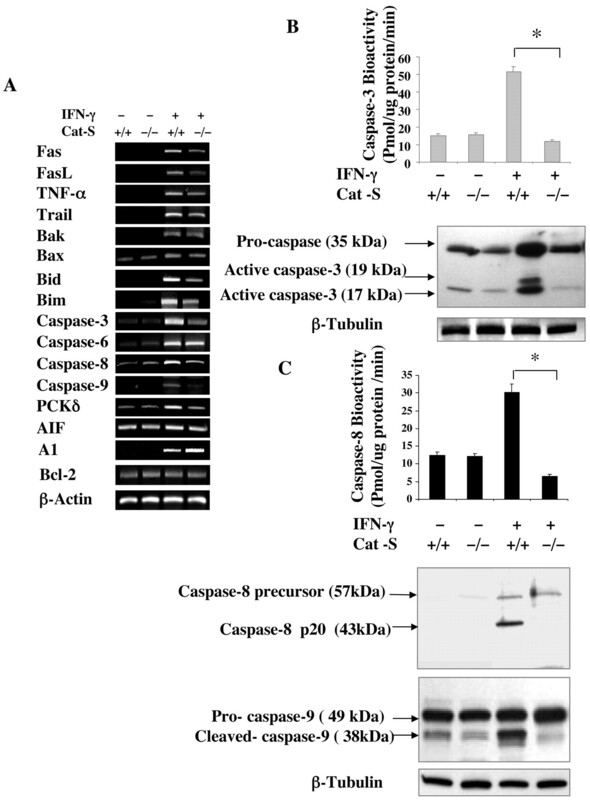 It also diminished the ability of IFN-γ to activate caspase-3, -8, and -9 (Fig. 6⇓, B and C). The Cat S mutation did not, however, alter the expression of Bak, caspase-6, Bcl-2, or A1 (Fig. 6⇓A). Similar alterations were induced by 05141, leupeptin, and E-64 (data not shown). Importantly, the chemical and genetic Cat S manipulations and the leupeptin and E-64 treatments did not alter the levels of BAL IFN-γ, demonstrating that the alterations they induced were not due to decreases in transgenic cytokine production (data not shown). Mechanisms of apoptosis and contributions of Cat S in IFN-γ transgenic mice. Transgene (−) and (+) mice with (+/+) and (−/−) Cat S loci were randomized to dox water or normal water for 4 wk. A, Whole lung RNA was extracted and the levels of mRNA encoding key apoptosis-regulating genes were evaluated. B, A bioassay (top) and Western blot (bottom) were used to evaluate the activation of caspase-3. C, A bioassay was used to quantitate caspase-8 activity (top) and Western blots (bottom) were used to assess caspase-8 and -9 activation. A—C, Representative of three similar evaluations. To further understand the importance of apoptosis, studies were undertaken to determine whether blocking apoptosis altered the ability of IFN-γ to induce tissue inflammation. When compared with WT mice on normal or dox water, transgenic IFN-γ caused a significant increase in BAL total cell, neutrophil, lymphocyte, and macrophage recovery and a patchy mononuclear tissue inflammatory response. These alterations were seen in transgenic mice on dox for as little as 2 wk and as long as 4 mo (Fig. 7⇓ and data not shown). These responses were at least partially apoptosis dependent because Z-VAD-fmk treatment or a null mutation of caspase-3 ameliorated the IFN-γ-induced increases in BAL total cell, neutrophil, lymphocyte, and macrophage accumulation and tissue inflammation at all time points (Fig. 7⇓, A, B. and D, and data not shown). In accord with our demonstration that IFN-γ induces apoptosis via a Cat S-dependent mechanism, similar decreases in BAL and tissue inflammation were noted in transgenic mice with null vs (+/+) Cat S loci (Fig. 7⇓, C and E). Roles of apoptosis and Cat S in IFN-γ regulation of inflammation. A, Transgene (−) and (+) mice were treated with Z-VAD-fmk (+) or vehicle and then given dox water. B and C, Transgene (−) and (+) mice with (+/+) and (−/−) caspase-3 and Cat S loci, respectively, were treated with dox. Two weeks later, BAL was undertaken and total cell recovery (A–C) and histology (D and E) were assessed. The values in A–C are the mean ± SEM of evaluations in a minimum of six animals. D and E, Representative of a minimum of four similar evaluations (∗, p < 0.05). Casp-3, Caspase-3. When compared with WT mice on normal or dox water, transgenic IFN-γ caused a significant increase in the levels of mRNA encoding cathepsins B, S, K, L, and H and matrix metalloproteinase (MMP)-2, -9, -12, and -14 (Fig. 8⇓). These responses were partially apoptosis dependent because null mutations of caspase 3 or Cat S ameliorated the IFN-γ-induced increases in the levels of mRNA encoding MMP-9 and cathepsin K in mice on dox for as little as 2 wk and as long as 4 mo (Fig. 8⇓). In contrast, the levels of mRNA encoding cathepsin H and MMP-2 and -12 were not altered in these systems (Fig. 8⇓, A and B). When viewed in combination, these studies demonstrate that cathepsin-dependent DNA injury/apoptosis is a critical event in the pathogenesis of the inflammatory and the proteolytic responses at sites of IFN-γ-induced tissue remodeling. Roles of apoptosis and Cat S in IFN-γ regulation of lung proteases. Transgene (−) and (+) mice with (+/+) and (−/−) caspase-3(A) and Cat S (B) loci were treated with dox. Two weeks later, the levels of mRNA encoding the noted cathepsins and MMPs were assessed. The panels are representative of a minimum of four similar evaluations. The present studies were designed to enhance our understanding of the mechanism(s) of IFN-γ-induced tissue remodeling and destruction. This was accomplished by characterizing the mechanism by which IFN-γ induces emphysema in the murine lung. These studies demonstrate that IFN-γ is a potent inducer of epithelial cell DNA injury and apoptosis and that these responses are mediated, in part, by a novel Cat S-dependent mechanism. They also demonstrate that this apoptosis is a critical event in IFN-γ-induced emphysema, inflammation, and protease accumulation. By linking in a cause and effect fashion, states of inflammation, enhanced protease activity, cellular DNA injury, and apoptosis and tissue destruction, they define a novel pathway of IFN-γ-induced tissue remodeling that may be operative in diverse biologic settings. In pulmonary emphysema, these observations provide the first pathogenetic construct that can unify the seemingly disparate inflammatory, protease/antiprotease, and apoptosis theories of disease pathogenesis. Apoptosis removes superfluous, damaged, or harmful cells in a wide variety of physiologic contexts. As a result, it plays a crucial role in morphogenesis, wound healing, neoplasia, the resolution of inflammation, and cellular homeostasis (35, 36). It is becoming increasingly clear, however, that dysregulation of apoptosis contributes to the pathogenesis of many human diseases and disorders (35, 36). This is nicely illustrated with IFN-γ, whose diverse antiviral, antineoplastic, and immunomodulatory activities are mediated, to a significant extent, by its ability to induce lymphocyte, macrophage, and neoplastic cell apoptosis (37, 38, 39). Our studies demonstrate that IFN-γ causes DNA injury and apoptosis in a variety of cells, including airway and type II alveolar epithelial cells in the murine lung, and that this apoptosis plays a key role in the pathogenesis of pulmonary emphysema. It is tempting to speculate from these studies that this cell death response leads to a structural weakening and cellular denudation of the alveolar septum, enhancing the ability of local proteases to digest the remaining tissue matrix and induce septal rupture. It is important to point out, however, that Z-VAD-fmk administration and the null mutation of caspase-3 or Cat S, while decreasing IFN-γ-induced apoptosis, only partially abrogated IFN-γ-induced emphysema. This suggests that apoptosis-independent events, caspase-independent apoptotic events, or other proteases also contribute to the pathogenesis of the IFN-γ-induced emphysematous phenotype. Cat S is a cysteine proteinase with potent endoproteolytic activity and a broad pH profile (40). It also plays an essential role in the processing of MHC II-associated invariant chain in B cells and dendritic cells and has been implicated in diverse tissue remodeling responses (41, 42). In the present studies, we demonstrate that IFN-γ is a potent stimulator of Cat S in pulmonary macrophages and epithelial cells. Importantly, we also demonstrate that a targeted null mutation or chemical inhibition of Cat S ameliorates IFN-γ-induced DNA injury, apoptosis, and emphysema. These studies implicate Cat S in the pathogenesis of these responses and demonstrate that Cat S-mediated cellular DNA injury and apoptosis may play an important role in a variety of tissue remodeling responses. The demonstration that Cat S is involved in cellular apoptosis is in accord with studies that demonstrate that lysosomal breakdown and cathepsin B release plays an important role in TNF-α-mediated hepatocyte apoptosis where it activates caspase-dependent and -independent cell death pathways (43, 44, 45). They are also in accord with studies that demonstrate that cathepsins can regulate p53 and cytotoxic agent-induced cellular responses (46), directly activate caspases (47), and degrade subcellular matrix which would diminish the survival signals that normally come from appropriate integrin-matrix interactions (38). Additional investigation will be required to determine whether the apoptotic effects of cathepsins are the result of their ability to augment intracellular apoptosis pathways, modulate extracellular matrix-cell interactions, or both. Because Cat S inhibition and null mutations of Cat S only partially abrogated IFN-γ-induced apoptosis and emphysema, additional investigation will also be required to define the proteases that are involved and the mechanisms of these Cat S-independent responses. To understand the mechanism(s) by which IFN-γ induces apoptosis in the lung, we evaluated the effects of IFN-γ on the expression of key components of the extrinsic and intrinsic cell death pathways. These studies demonstrate that IFN-γ is a potent stimulator of both pathways. They also demonstrate that IFN-γ simultaneously induces the anti-apoptotic A1 protein that may feedback to control lung epithelial cell apoptosis. Interestingly, when Cat S was genetically or chemically ablated, the ability of IFN-γ to stimulate and activate caspase-3, -8, and -9 and to stimulate the expression of Bim, Bid, Fas, FasL, TNF-α, TRAIL, and PKCδ was markedly diminished. These are the first studies to define the role of lysosomal cathepsins (specifically, Cat S) in IFN-γ-induced apoptosis and the first to highlight the importance of Cat S in IFN-γ activation of both the intrinsic/mitochondrial and extrinsic apoptosis pathways. In our experiments, TUNEL-positive cells undergoing apoptosis and activated caspases can be appreciated in lungs from transgenic mice on dox for as little as 2 wk and as long as 4 mo. In these mice, IFN-γ is produced chronically during the period of dox administration. Because apoptotic cells are usually cleared rapidly and activated caspases are usually detected transiently, these findings likely represent ongoing IFN-γ-induced injury. Thus, the apoptotic cells and activated caspases that are seen at each time point likely represent and come from cells that have only recently been injured. However, it is known that macrophages from patients with COPD have a defect in the phagocytosis of apoptotic epithelial cells and that cigarette smoke compromises macrophage phagocytosis of apoptotic neutrophils (48, 49). Thus, it is also possible that the delayed clearance of apoptotic cells is seen in this setting. Additional experimentation will be required to define the integrity of the apoptotic cell clearance mechanisms in the IFN-γ-treated lung. Unlike necrosis in which cellular disintegration releases toxic and injurious contents, apoptosis is thought to provide an injury-limiting mechanism of cell clearance that allows for the resolution of inflammation. This concept, however, may not be operative in all situations because uncleared apoptotic bodies can undergo secondary necrosis and apoptotic macrophages can induce macrophage-rich tissue inflammation (50, 51). Our studies support this conceptual revision by demonstrating that interventions that block epithelial cell apoptosis diminish IFN-γ-induced inflammation. They also demonstrate that apoptosis contributes to local tissue protease expression. Thus, epithelial apoptosis plays an important role in driving the IFN-γ-induced inflammatory and proteolytic responses in the lung. When viewed in combination with our demonstration that IFN-γ induces apoptosis and that apoptosis plays an important role in the pathogenesis of pulmonary emphysema, one can envision a complex and intimate relationship among inflammation, apoptosis, and emphysema. In this conceptualization, the genesis of emphysema requires an insult(s) that induces Th1/Tc1 inflammation and IFN-γ production. This inflammation induces epithelial cell apoptosis and generates pulmonary emphysema. The IFN-γ also activates an apoptosis-dependent positive feedback loop that can drive, amplify, and contribute to the chronic nature of this inflammatory response. This positive feedback loop may be responsible for the relentlessly progressive lung function deterioration and chronic inflammation that are seen in COPD and other Th1 inflammatory and remodeling responses. In summary, our studies highlight a Cat S-dependent apoptosis/DNA injury pathway and demonstrate that it plays a key role in IFN-γ-induced alveolar remodeling and emphysema. These findings validate Cat S and components of the DNA injury/cell death response it regulates as potential targets against which therapies can be directed in the treatment of emphysema and Th1 diseases as diverse as atherosclerosis, rheumatoid arthritis, Crohn’s disease, celiac disease, periodontitis, and atrophic gastritis. This is an attractive prospect because Cat S inhibitors are already known to control atherosclerosis (41) and can inhibit Th1 inflammation (52). Additional investigation of the therapeutic utility of apoptosis and/or cathepsin-based therapies for emphysema and other diseases characterized by Th1/Tc1 inflammation, protease excess, and tissue destruction is warranted. We thank Kathleen Bertier for her excellent secretarial assistance and Suping Chen for her excellent technical assistance. ↵1 This work was supported by the National Institutes of Health Grants HL-64242, HL-78744, HL-66571, and HL-56389 (J.A.E.). ↵3 Abbreviations used in this paper: COPD, chronic obstructive pulmonary disease; rtTA, reverse tetracycline transactivator; dox, doxycycline; CC10, Clara cell 10-kDa protein; Cat S, cathepsin S; Z-VAD-fmk, N-benzylcarboxy-Val-Ala-Asp-fluoromethylketone; WT, wild type; PI, propidium iodine; BAL, bronchoalveolar lavage; SP-C, surfactant aproprotein C; TRAIL, TNF-related apoptosis-inducing ligand; FasL, Fas ligand; MMP, metalloproteinase; PKC, protein kinase C.
Tellides, G., D. A. Tereb, N. C. Kirkiles-Smith, R. W. Kim, J. H. Wilson, J. S. Schechner, M. I. Lorder, J. S. Pober. 2000. Interferon-γ elicits arteriosclerosis in the absence of leukocytes. Nature 403: 207-211. Bouma, G., W. Strober. 2003. The immunological and genetic basis of inflammatory bowel disease. Nat. Rev. Immunol. 3: 521-533. Lundin, K. E.. 2003. Oats induced villous atrophy in coeliac disease. Gut 52: 1649-1652. Vervoordeldonk, M. J., P. P. Tak. 2002. Cytokines in rheumatoid arthritis. Curr. Rheumatol. Rep. 4: 208-217. Garlet, G. P., W. Martins, Jr, B. R. Ferreira, C. M. Milanezi, J. S. Silva. 2003. Patterns of chemokines and chemokine receptors expression in different forms of human periodontal disease. J. Periodont. Res. 38: 210-217. Ben Ahmed, M., H. Houman, M. Miled, K. Dellagi, H. Louzir. 2004. Involvement of chemokines and Th1 cytokines in the pathogenesis of mucocutaneous lesions of Behçet’s disease. Arthritis Rheum. 50: 2291-2295. Borra, R. C., P. M. Andrade, I. D. Silva, A. Morgun, L. L. Weckx, A. S. Smirnova, M. Franco. 2004. The Th1 /Th2 immune-type response of the recurrent aphthous ulceration analyzed by cDNA microarray. J. Oral. Pathol. Med. 33: 140-146. Katakai, T., T. Hara, M. Sugai, H. Gonda, A. Shimizu. 2003. Th1-biased tertiary lymphoid tissue supported by CXC chemokine ligand 13-producing stromal network in chronic lesions of autoimmune gastritis. J. Immunol. 171: 4359-4368. Foxman, E., F.M. Zhang, S. D. Hurst, T. Muchamuel, D. Shen, E. F. Wawrousek, C. C. Chan, I. Gery. 2002. Inflammatory mediators in uveitis: differential induction of cytokines and chemokines in Th1- versus Th2-mediated ocular inflammation. J. Immunol. 168: 2483-2492. Ehlers, S., J. Benini, H. D. Held, C. Roeck, G. Alber, S. Uhlig. 2001. αβ T cell receptor-positive cells and interferon-γ, but not inducible nitric oxide synthase, are critical for granuloma necrosis in a mouse model of mycobacteria-induced pulmonary immunopathology. J. Exp. Med. 194: 1847-1859. Saetta, M., S. Baraldo, G. Turato, B. Beghe, G. L. Casoni, C. M. Bellettato, F. Rea, R. Zuin, L. M. Fabbri, A. Papi. 2003. Increased proportion of CD8+ T-lymphocytes in the paratracheal lymph nodes of smokers with mild COPD. Sarcoidosis Vasc. Diffuse Lung Dis. 20: 28-32. Saetta, M., M. Mariani, P. Panina-Bordignon, G. Turato, C. Buonsanti, S. Baraldo, C. M. Bellettato, A. Papi, L. Corbetta, R. Zuin, et al 2002. Increased expression of the chemokine receptor CXCR3 and its ligand CXCL10 in peripheral airways of smokers with chronic obstructive pulmonary disease. Am. J. Respir. Crit. Care Med. 165: 1404-1409. Saetta, M., S. Baraldo, L. Corbino, G. Turato, F. Braccioni, F. Rea, G. Cavallesco, G. Tropeano, C. E. Mapp, P. Maestrelli, et al 1999. CD8+ve cells in the lungs of smokers with chronic obstructive pulmonary disease. Am. J. Respir. Crit. Care Med. 160: 711-717. O’Shaughnessy, T. C., T. W. Ansari, N. C. Barnes, P. K. Jeffery. 1997. Inflammation in bronchial biopsies of subjects with chronic bronchitis: Inverse relationship of CD8+ T lymphocytes with FEV1. Am. J. Respir. Crit. Care Med. 155: 852-857. Cosio, M. G., A. Guerassimov. 1999. Chronic obstructive pulmonary disease. Am. J. Respir. Crit. Care Med. 160: S21-S25. Grumelli, S., D. B. Corry, L. Z. Song, L. Song, L. Green, J. Huh, J. Hacken, R. Espada, R. Bag, D. E. Lewis, F. Kheradmano. 2004. An immune basis for lung parenchymal destruction in chronic obstructive lung disease and emphysema. PLoS Med. 1: e8. Wang, Z., T. Zheng, Z. Zhu, R. J. Homer, R. J. Riese, H. A. Chapman, S. D. Shapiro, J. A. Elias. 2000. Interferon γ induction of pulmonary emphysema in the adult murine lung. J. Exp. Med. 192: 1587-1600. Senior, R. M., S. D. Shapiro. 1998. Chronic obstructive pulmonary disease: epidemiology, pathophysiology, and pathogenesis. A. P. Fishman, Jr, et al ed. In Fishman’s Pulmonary Diseases and Disorders Vol. 1: 659-681 McGraw-Hill, New York. .
Sutherland, E. R., R. M. Cherniack. 2004. Management of chronic obstructive pulmonary disease. N. Engl. J. Med. 350: 2689-2697. Hogg, J. C., F. Chu, S. Utokaparch, R. Woods, W. M. Elliott, L. Buzata, R. M. Cherniack, R. M. Rogers, F. C. Sciurba, H. O. Coxson, P. D. Pare. 2004. The nature of small-airway obstruction in chronic obstructive pulmonary disease. N. Engl. J. Med. 350: 2645-2653. Saetta, M.. 1999. Airway inflammation in chronic obstructive pulmonary disease. Am. J. Respir. Crit. Care Med. 160: 517-520. Majo, J., H. Ghezzo, M. G. Cosio. 2001. Lymphocyte population and apoptosis in the lungs of smokers and their relation to emphysema. Eur. Respir. J. 17: 946-953. Aoshiba, K., N. Yokohori, A. Nagai. 2003. Alveolar wall apoptosis causes lung destruction and emphysematous changes. Am. J. Respir. Cell Mol. Biol. 28: 555-562. Segura-Valdez, L., A. Pardo, M. Gaxiola, B. D. Uhal, C. Becerril, M. Selman. 2000. Upregulation of gelatinases A and B, collagenases 1 and 2, and increased parenchymal cell death in COPD. Chest 117: 684-694. Kasahara, Y., R. M. Tuder, L. Taraseviciene-Stewart, T. D. Le Cras, S. Abman, P. K. Hirth, J. Waltenberger, N. F. Voelkel. 2000. Inhibition of VEGF receptors causes lung cell apoptosis and emphysema. J. Clin. Invest. 106: 1311-1319. Kasahara, Y., R. M. Tuder, C. D. Cool, D. A. Lynch, S. C. Flores, N. F. Voelkel. 2001. 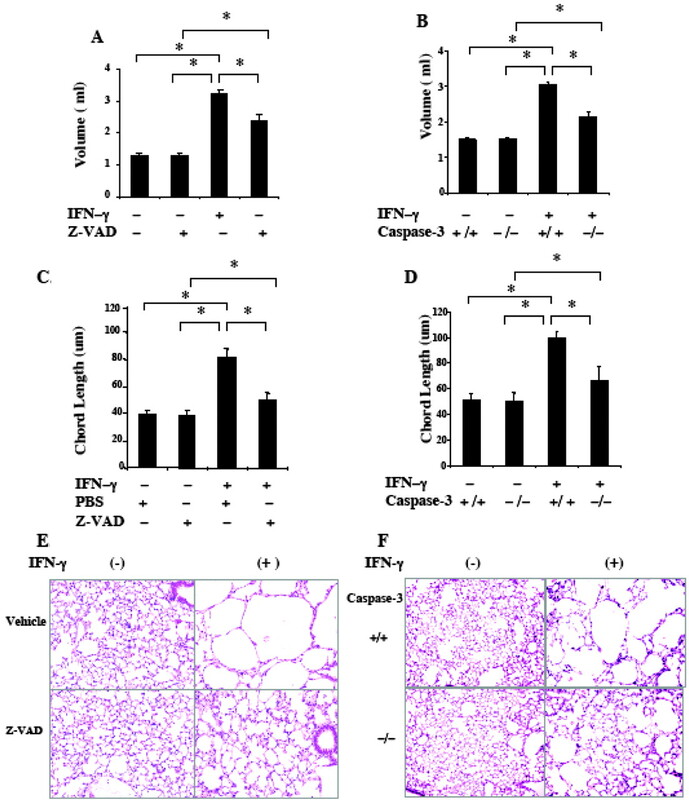 Endothelial cell death and decreased expression of vascular endothelial growth factor and vascular endothelial growth factor receptor 2 in emphysema. Am. J. Respir. Crit. Care Med. 163: 737-744. Shi, G. P., J. A. Villadangos, G. Dranoff, C. Small, L. Gu, K. J. Haley, R. Riese, H. L. Ploegh, H. A. Chapman. 1999. Cathepsin S required for normal MHC class II peptide loading and germinal center development. Immunity 10: 197-206. Kuida, K., T. S. Zheng, S. Na, C. Kuan, D. Yang, H. Karasuyama, P. Rakic, R. A. Flavell. 1996. Decreased apoptosis in the brain and premature lethality in CPP32-deficient mice. Nature 384: 368-372. Le, D. A., Y. Wu, Z. Huang, K. Matsushita, N. Plesnila, J. C. Augustinack, B. T. Hyman, J. Yuan, K. Kuida, R. A. Flavell, M. A. Moskowitz. 2002. Caspase activation and neuroprotection in caspase-3-deficient mice after in vivo cerebral ischemia and in vitro oxygen glucose deprivation. Proc. Natl. Acad. Sci. USA 99: 15188-15193. Lee, C. G., S. J. Cho, M. J. Kang, S. P. Chapoval, P. J. Lee, P. W. Noble, T. Yehualaeshet, B. Lu, R. A. Flavell, J. Milbrandt, et al 2004. Early growth response gene 1-mediated apoptosis is essential for transforming growth factor β1-induced pulmonary fibrosis. J. Exp. Med. 200: 377-389. Corti, M., A. R. Brody, J. H. Harrison. 1996. Isolation and primary culture of murine alveolar type II cells. Am. J. Respir. Cell Mol. Biol. 14: 309-315. Zheng, T., Z. Zhu, Z. Wang, R. J. Homer, B. Ma, R. J. Riese, Jr, H. A. Chapman, Jr, S. D. Shapiro, J. A. Elias. 2000. Inducible targeting of IL-13 to the adult lung causes matrix metalloproteinase- and cathepsin-dependent emphysema. J. Clin. Invest. 106: 1081-1093. Joza, N., G. Kroemer, J. M. Penninger. 2002. Genetic analysis of the mammalian cell death machinery. Trends Genet. 18: 142-149. Li, J. H., M. S. Kluger, L. A. Madge, L. Zheng, A. L. Bothwell, J. S. Pober. 2002. Interferon-γ augments CD95(APO-1/Fas) and pro-caspase-8 expression and sensitizes human vascular endothelial cells to CD95-mediated apoptosis. Am. J. Pathol. 161: 1485-1495. Wang, W. J., J. C. Kuo, C. C. Yao, R. H. Chen. 2002. DAP-kinase induces apoptosis by suppressing integrin activity and disrupting matrix survival signals. J. Cell Biol. 159: 169-179. Zheng, H., R. C. Luo, L. S. Zhang, G. F. Mai. 2002. Interferon-γ up-regulates Fas expression and increases Fas-mediated apoptosis in tumor cell lines. Di Yi Jun Yi Da Xue Xue Bao. 22: 1090-1102. Shi, G. P., A. C. Webb, K. E. Foster, J. H. Knoll, C. A. Lemere, J. S. Munger, H. A. Chapman. 1994. Human cathepsin S: chromosomal localization, gene structure, and tissue distribution. J. Biol. Chem. 269: 11530-11536. Sukhova, G. K., Y. Zhang, J. H. Pan, Y. Wade, T. Yamamoto, M. Naito, T. Kodama, S. Tsimikas, J. L. Witztum, M. L. Lu, et al 2003. Deficiency of cathepsin S reduces atherosclerosis in LDL receptor-deficient mice. J. Clin. Invest. 111: 897-906. Jormsjo, S., D. M. Wuttge, A. Sirsjo, C. Whatling, A. Hamsten, S. Stemme, P. Eriksson. 2002. Differential expression of cysteine and aspartic proteases during progression of atherosclerosis in apolipoprotein E-deficient mice. Am. J. Pathol. 161: 939-945. Guicciardi, M. E., J. Deussing, H. Miyoshi, S. F. Bronk, P. A. Syingen, C. Peters, S. H. Kaufmann, G. J. Gores. 2000. Cathepsin B contributes to TNF-α-mediated hepatocyte apoptosis by promoting mitochondrial release of cytochrome c. J. Clin. Invest. 106: 1127-1137. Lotem, J., L. Sachs. 1996. Differential suppression by protease inhibitors and cytokines of apoptosis induced by wild-type p53 and cytotoxic agents. Proc. Natl. Acad. Sci. USA 93: 12507-12512. Vancompernolle, K., F. Van Herreweghe, G. Pynaert, M. Van de Craen, K. de Vos, N. Totty, A. Sterling, W. Fiers, P. Vandenabeele, J. Grooten. 1998. Atractyloside-induced release of cathepsin B, a protease with caspase-processing activity. FEBS Lett. 438: 150-158. Hodge, S., G. Hodge, R. Scicchitano, P. N. Reynolds, M. Holmes. 2003. Alveolar macrophages from subjects with chronic obstructive pulmonary disease are deficient in their ability to phagocytose apoptotic airway epithelial cells. Immunol. Cell Biol. 81: 289-296. Kirkham, P. A., G. Spooner, I. Rahman, A. G. Rossi. 2004. Macrophage phagocytosis of apoptotic neutrophils is compromised by matrix proteins modified by cigarette smoke and lipid peroxidation products. Biochem. Biophys. Res. Commun. 318: 32-37. Wang, L., J. M. Antonini, Y. Rojanasakul, V. Castranova, J. F. Scabilloni, R. R. Mercer. 2003. Potential role of apoptotic macrophages in pulmonary inflammation and fibrosis. J. Cell Physiol. 194: 215-224. Savill, J., C. Haslett. 1995. Granulocyte clearance by apoptosis in the resolution of inflammation. Semin. Cell Biol. 6: 385-393. Katunuma, N., Y. Matsunaga, K. Himeno, Y. Hayashi. 2003. Insights into the roles of cathepsins in antigen processing and presentation revealed by specific inhibitors. Biol. Chem. 384: 883-890.